Dr. Sarah Kim leads a vibrant and diverse career as performer, educator, and arts administrator. She is an acclaimed instructor who was named 2016 Ohio String Teachers Association Studio Teacher of the Year as well as a recipient of the 2015 Overture Arts Educator Awards by the Cincinnati Arts Association. Dr. Kim serves on the string faculty of the College-Conservatory of Music at the University of Cincinnati. She is also Executive Director of the Cincinnati Young Artists, a nationally recognized program presenting advanced chamber music and cello workshops for pre-college and college students throughout the year at CCM. During the summers Dr. Kim is an Artist Faculty member of the Green Mountain Chamber Music Festival and the Aria International Summer Academy. 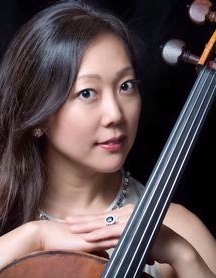 In demand as a clinician at throughout the country, Dr. Kim has given master classes at numerous cello festivals and workshops at major universities. Her students have been top prize winners in national competitions and soloists with the Cincinnati Symphony and Louisville Orchestras. She has adjudicated local and national competitions such as the MTNA National Finals. As a solo artist and chamber musician, Dr. Kim has performed across the U.S. and Europe. She continues to be an active performer in the Cincinnati area where she has performed with the Cincinnati Symphony Orchestra, Louisville Orchestra, Cincinnati Chamber Orchestra and as guest principal cello of the Kentucky Symphony Orchestra. Dr. Kim maintains a strong interest in cello pedagogy and regularly attends and presents at conferences such as the American String Teachers Association and Suzuki Association of the Americas. Dr. Kim has been instrumental in developing pre-college programs at the renowned School for Creative and Performing Arts and the Hyde Park Gifted Academy as well as acting as a pedagogical consultant for the CCM preparatory department Suzuki programs. She routinely mentors young teachers at CCM and the Cincinnati area. A native of Minneapolis, MN, Dr. Kim attended Eastman School of Music (B.Mus. ), Northwestern University (M.Mus. ), and the the College-Conservatory of Music at the University of Cincinnati (D.M.A.). Her primary studies have been with Peter Howard, Steven Doane, and Hans Jørgen Jensen.